Got a knife sharpened for free. Also a new suet feeder for the birds, and a salt shaker shaped like a clam or mussel. I only needed one. plus a large basket to keep yarn in. a free bagged lunch and water at a info session for caregivers ..wasn't expecting it esp at 230. Slice of cheesecake the kid brought home and didn't eat. My mom gave me some of the chili that she had made in bulk. Such good cooking too! A salted nut roll from grocery store. A large hardcover book with 501 quilt block patterns, and a smaller quilt pattern book. Someone at Husby's work purged her sewing room and set out tons of quilt books and magazines for people to take. A nice coffee mug from Husby's work with a saying on it that seems appropriate for someone about to retire, "oh, the places we will go" and the name of his division on it. Everyone got one. fancy soap vanilla citrus scent ..someone bought gifts they didn't want soap, candles etc all really nice stuff. I guess this counts so here it goes, our neighbor saw my dh working on my ds car. Dh was putting on hub assemblies in the freezing cold. Our neighbor saw dh and came to help. Dh and our neighbor help each other all the time but this was really appreciated because it was so cold out. Nice of the neighbor to help. Sounds like he has a big heart. We got 2 free cans of pineapple from the grocery store today. Maybe I'll make Jell-O with it. 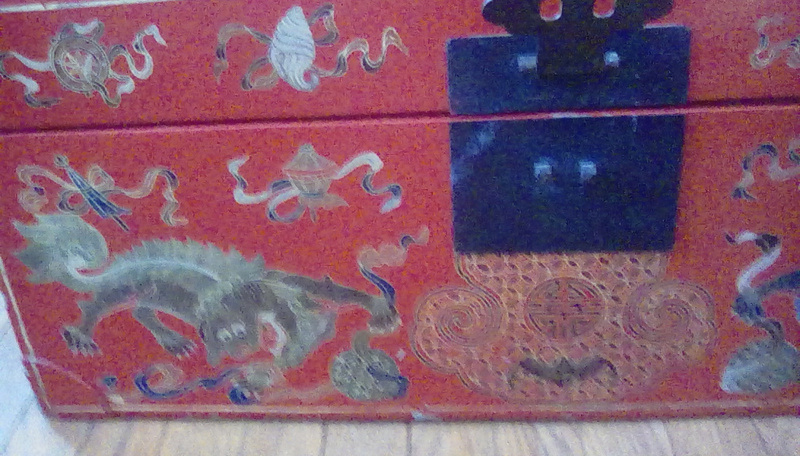 got a seriously cool metal trunk, painted with Chinese symbols on the outside, and lined with yellow fabric inside. I'll try to post a pic tomorrow. A lot of leftovers from my birthday party yesterday. 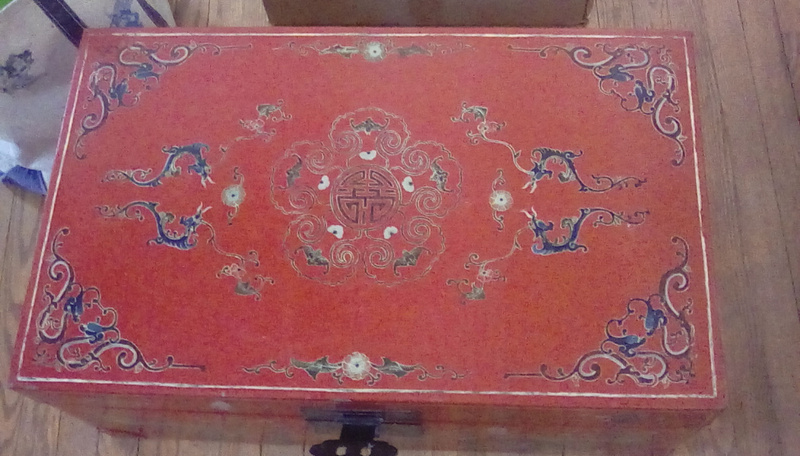 My Chinese chest, looks so much better than a cardboard box for storage. small orange juice from the gas station (smartpay reward) and $5 from the local grocery chain's online community. I get it every month if I have 4 or more activities online. The weather was blizzard conditions and I drove to work....The manager gave me $5 so I spent it on a cilantro burrito and cake. I won some chocolate through my supermarket's app.